Multiple reaction monitoring (MRM), sometimes called selected reaction monitoring (SRM), is a directed tandem mass spectrometric technique performed on to triple quadrupole mass spectrometers. 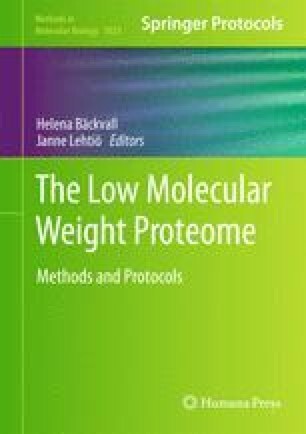 MRM assays can be used to sensitively and specifically quantify proteins based on peptides that are specific to the target protein. Stable-isotope-labeled standard peptide analogues (SIS peptides) of target peptides are added to enzymatic digests of samples, and quantified along with the native peptides during MRM analysis. Monitoring of the intact peptide and a collision-induced fragment of this peptide (an ion pair) can be used to provide information on the absolute peptide concentration of the peptide in the sample and, by inference, the concentration of the intact protein. This technique provides high specificity by selecting for biophysical parameters that are unique to the target peptides: (1) the molecular weight of the peptide, (2) the generation of a specific fragment from the peptide, and (3) the HPLC retention time during LC/MRM-MS analysis. MRM is a highly sensitive technique that has been shown to be capable of detecting attomole levels of target peptides in complex samples such as tryptic digests of human plasma. This chapter provides a detailed description of how to develop and use an MRM protein assay. It includes sections on the critical “first step” of selecting the target peptides, as well as optimization of MRM acquisition parameters for maximum sensitivity of the ion pairs that will be used in the final method, and characterization of the final MRM assay. This work was funded by a platform grant from Genome Canada and Genome British Columbia.